At the power-hungry heart of industrial London, Sands End boasted a power station, gas-works and petrol depot in the early 20th century, providing employment for generations of local working families. The strong sense of community built during that period has endured despite the many changes in the surrounding neighbourhood. The photographs in this book are mainly from the period between 1940 and 1970 and feature the people and buildings which together made up the community. The Queen Elizabeth pub on the corner of Bagleys Lane has remained largely unchanged since it was built in the 19th century. There is also a picture taken outside the pub, of the aftermath of a gangland stabbing, part of a war between rival scrap metal dealers which was part of life during the 1960s. The famous power station is featured of course, with photographs of the turbines in action inside as well as the impressive exterior. The BP/Shell oil terminal is shown after being bombed during the war and there are several pictures of street parties celebrating the end of the war in 1945 and again after the coronation in 1953. 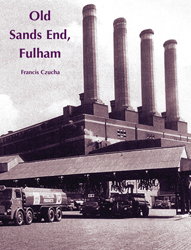 The street-by-street composition of this book makes it a nostalgic and very personal record of a distinctive era which will strike a chord not only with with past residents of Sands End but with other Londoners who remember a sense of community now sadly long gone.